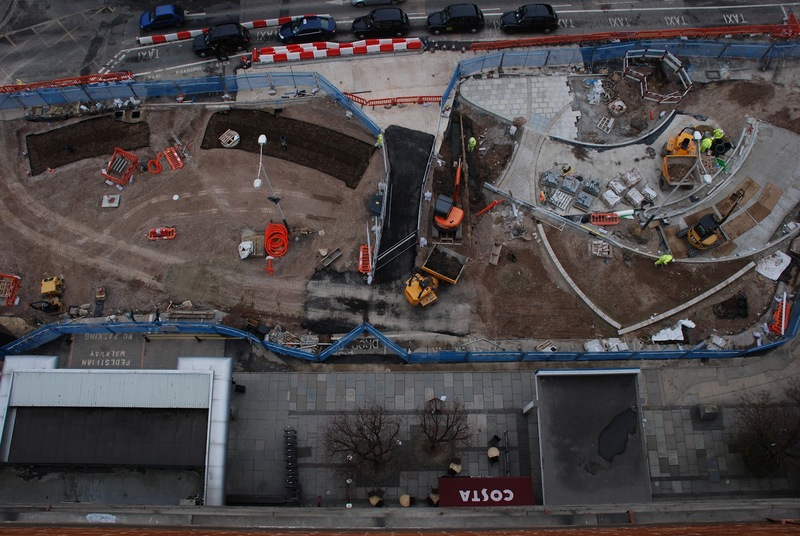 The shape of the paving, starting to resemble the drawings in the site office, as seen from 12-storeys up (click on the images for a closer look). Looking over a wall isn't normally encouraged, especially so when the wall has a 12-storey drop over the other side of it! 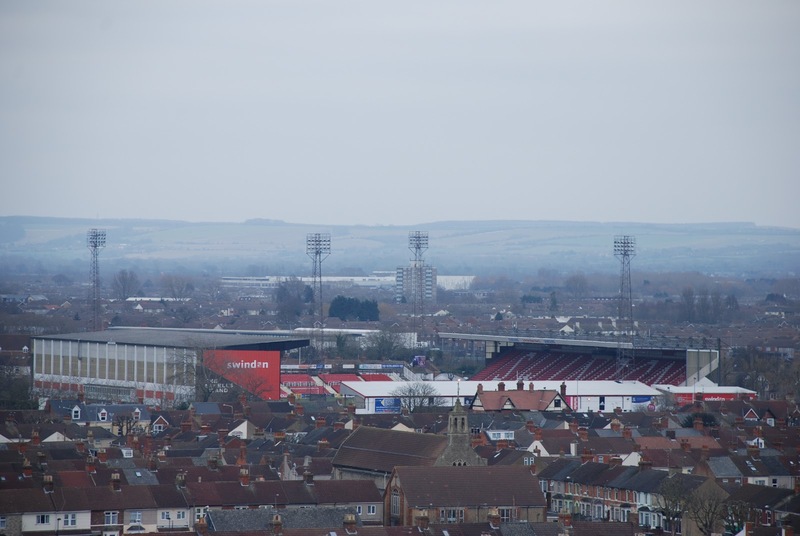 Today saw a second visit to the roof of Swindon Railway Station's Signal Point building, continuing the Swindon Rail Station project. Graham and Dan from Britannia (the contractor for the work) also came up for a look. Just before, in the site office, they showed the highly-detailed plan for the paving on the forecourt. Areas of different paving are separated by intersecting, curved lines (inspired by the gradual curved map lines of the Great Western Railway). At ground level, the paving, curves and yet-to-be-filled plots of ground looks like a headache-inducing jigsaw puzzle, but through a handheld device (it was yellow and looked like one of those electronic signing devices when a parcel's delivered), the exact places are plotted and followed to the designer's letter. Zooming in, the smooth curves and shapes of the design can be seen and understood, giving a flavour of what the finished forecourt will look like (click on the image for a closer look). 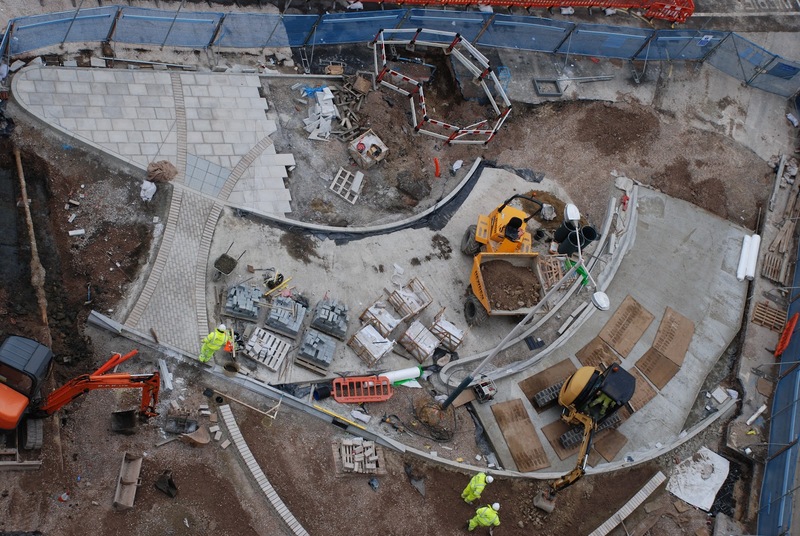 From the roof, seeing the initial area of paving being worked on gave a great sense of what the finished work will look like and the style of the whole works. We're planning to do weekly roof-top visits to give a better step-by-step sense of the work from this great bird's eye view.